In this session, our speaker discusses the most common staff-related challenges facing self-storage businesses today as well as strategies to avoid employment dangers. 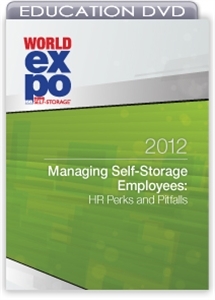 When it comes to employee management, the same human resources perks and pitfalls that exist in larger companies can also apply to smaller self-storage operations. In this session, our speaker discusses the most common staff-related challenges facing self-storage businesses today as well as strategies to avoid employment dangers. Learn how to ensure smooth staffing at your facility and maximize team success. • How to "manage the millenials"